What's Your "One Thing" for 2015? You are here: Home / Uncategorized / WHAT’S YOUR “ONE THING” FOR 2015? 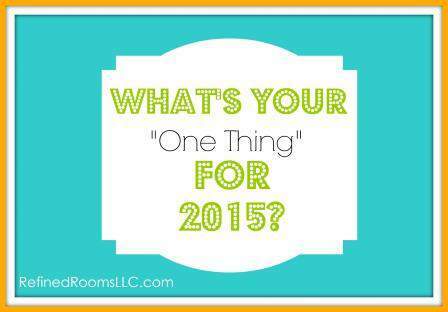 WHAT’S YOUR “ONE THING” FOR 2015? It’s so easy to get swept up in the excitement of the new year, don’t you agree? I have a history of being overzealous when it comes to my list of New Year’s resolutions. My tendency is to attempt to achieve too many goals simultaneously, which often results in a failure to achieve any of them. Can you relate? I smartened up over the last couple of years and started to heed the advice that I often give my clients…focus on just one thing at a time. In 2014, my one organizing goal was to improve the functionality of several closets in our home (the guest room and my daughter’s bedroom). So what is my One Thing for 2015? Actually, it has nothing to do with tackling a space within my home. For years, our family has struggled with the “It’s 4:00…What’s for Dinner?” Syndrome, which leads to a lot of unnecessary stress, unhealthy eating habits, and overspending. So my One Thing for 2015 is to consistently plan out and shop for our weekly meals ahead of time. How can I increase the probability of meeting my goal/resolution? Communicating your desire to achieve a goal to other people and asking them to support you and hold you accountable throughout the process is one of the most powerful methods for helping you stick to your commitment. Now that I’ve put my 2015 goal out there for all of you to see, I’ve got no choice but to achieve my goal! I invite you to hold me accountable via blog comments, emails, and Facebook check ins. My plan is to write a follow-up post at the end of February to share my progress. I invite you to share your One Thing for this year below in the comments section. Perhaps it’s a chaotic space you’d like to tackle, a system you plan to implement in order to increase household efficiency, or a clutter-producing habit that you’d like to nip in the bud. I’d love to serve as your accountability partner in order to help you achieve success in 2015! UPDATE: Check out my accountability check-in post to see how I fared with my “one thing”! Whoo Hoo, Natalie! Looks like a well-thought out and specific plan, filled with doable action steps! I can’t wait to read your February update!!! My “one thing” for 2015 is to be deliberate. This means, choosing my tasks with a focus – and thinking through how these tasks relate back to my big goals, and identifying the most favorable outcome for each task. Feel free to check in!!! That is a GREAT one Rebecca! Do you have any specific actions steps to move you forward? 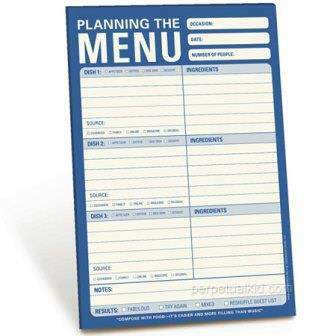 I do a meal menu for a two week period and I think that I will add the activity onto my menu. I think that I will be incorporating a family meeting so we can all decide together our meals/activities. I have the internet to decide on crafts and experiments, I will pick out a few and present them for the family to decide. I find that the weekly Family Meeting is the key to ensuring that the Family Ship sails smoothly throughout the week. It is a must once the kids hit school-age. Bravo to you!